1. At the invitation of H.E. 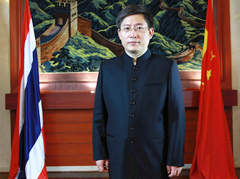 Zhu Rongji, Premier of the State Council of the People's Republic of China, H.E. Pol. Lt. Col. Thaksin Shinawatra, Prime Minister of the Government of the Kingdom of Thailand, paid an official visit to the People's Republic of China from 27 to 29 August 2001. During his visit, Prime Minister Thaksin met with H.E. Jiang Zemin, President of the People's Republic of China (PRC), H.E. Li Peng, Chairman of the Standing Committee of the National People's Congress of the PRC, and held official talks with Premier Zhu Rongji. The two sides had an in-depth exchange of views on the bilateral relations and on international and regional issues of mutual interest, and reached a broad consensus. During the visit The Agreement on Cultural Co-operation Between the Governments of the People's Republic of China and the Kingdom of Thailand and the Memorandum of Understanding on Establishing a Bilateral Business Council Between the China Council for the Promotion of International Trade and the Board of Trade of Thailand were signed. Prime Minister Thaksin thanked the Government and the people of the PRC for their warm and generous hospitality. Both sides agreed that the visit was a complete success and helped promote the all-dimensional cooperative relationship of good-neighborliness and mutual trust between China and Thailand. 2. During their meetings and talks, leaders of the two countries expressed their satisfaction with the progress and development of China-Thailand relations. They agreed to consolidate the existing traditional friendship and work for strategic cooperation between China and Thailand, believing that this would be in the fundamental interests of their two countries and contribute to peace, prosperity and development in the region. 3. The two sides reiterated their full endorsement and support for the Joint Statement on the Plan of Action for the 21st Century Between the People's Republic of China and the Kingdom of Thailand, signed in Bangkok on 5 February 1999. Both sides were happy with the positive progress of China-Thailand friendly cooperation in all areas over the last few years. They reaffirmed the significance of the Joint Statement in guiding the future development of China-Thailand relations. The two sides indicated that they would take concrete measures to vigorously implement the various cooperation programmes outlined in the Joint Statement and further promote all-dimensional cooperative relationship of good neighborliness and mutual respect and mutual trust between the two countries. 4. Both sides agreed that the cooperation between the two countries in the political, economic and cultural, educational, public health, scientific and technological areas and other fields had yielded substantial and fruitful benefits for both countries and their peoples. They spoke highly of the positive role played by the China-Thailand Joint Trade and Economic Committee, the China-Thailand Joint Committee on Science and Technology and other cooperative mechanisms in enhancing China-Thailand cooperation in all areas. Both sides underlined the importance of continuously expanding exchanges and cooperation between the two countries in the above-mentioned areas in the promotion of comprehensive development of the bilateral relations. 5. The two sides expressed satisfaction with the achievements in the bilateral trade and economic cooperation. They agreed that trade and economic cooperation had become an increasingly powerful engine driving China-Thailand relations. Both sides expressed their continued commitment to launching new areas of trade and economic cooperation, actively promoting large-scale bilateral economic cooperation projects and expanding the bilateral trade and two-way investment on the basis of equality and mutual benefit. Both sides reaffirmed their intention to bring the Swap Agreement between Thailand and China to an early conclusion. Both sides agreed to further develop trade and cultural ties through sister-city relations between the two countries. Both sides agreed that China's entry into the World Trade Organization and its strategy of developing the western region would bring about new opportunities for China-Thailand trade and economic cooperation. 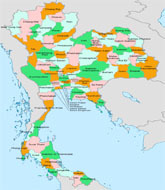 In addition, with the prospects of the AFTA tariff schemes set to be reduced to 0-5 percent by the year 2002, and eliminated by the year 2010, the Thai side hoped that China would take advantages of investment and trading opportunities by relocating its manufacturing industry to Thailand and ASEAN countries. The two sides expressed their support for more extensive trade and economic exchanges and cooperation between China's southwestern region and Thailand's northern region, particularly land transportation links between the two countries. They also agreed to explore further areas of economic cooperation between the two countries. 6. The Thai side stated that a stable and prosperous China would contribute to peace and development in the region and beyond. The Thai side reiterated that there is only one China, that Taiwan is a part of China, and that Thailand remains committed to the One China policy. The Thai side congratulated Beijing on its successful bid for hosting the 2008 Olympic Games and indicated that it would work closely with the Chinese side to ensure a complete success of the event. 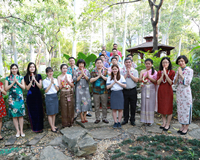 The Chinese side expressed its high appreciation for such position of the Thai side. The Chinese side congratulated the Thai Government on its achievements in alleviating poverty, revitalising the country's economy and promoting regional cooperation, believing that Thailand's economic and social development would be of great importance to stability and prosperity in the region. 7. Both sides underlined the fruitful cooperation between the two countries in international and regional affairs. They welcomed the convocation and the positive results of the China, Laos, Myanmar and Thailand Ministerial Conference on Drug Control, held in Beijing on 27-28 August 2001. The two sides agreed that closer cooperation among the four countries in combating illicit drugs would facilitate the crackdown on drug-related crimes in the region and promote peace and development in the region. The Thai side also expressed its gratification with China's greater support and cooperation in effectively realizing the quadrilateral cooperation in their fight against the problems of illegal drugs. Recognising the success of the Ministerial Conference hosted by China, the two sides expressed the determination to push the process forward. The Thai side indicated its willingness to host a higher level meeting in due course. 8. The two sides agreed that given the accelerated development of economic globalisation, it was imperative for Asian countries to further strengthen regional cooperation and work jointly to seize the opportunities and meet the challenges brought about by economic globalisation. The two sides expressed their commitment to push forward the ASEAN, China, ROK and Japan (10+3) cooperation process and Mekong Basin development. The Chinese side expressed its appreciation for the positive efforts of the Thai side in strengthening dialogue and cooperation among Asian countries. The Chinese side also expressed its hope for a more united, stable and prosperous ASEAN and its support for a greater role by ASEAN in regional and international affairs. 9. The two sides agreed that more dialogue, enhanced mutual trust and closer coordination on an equal footing are the important guiding principles in promoting peace and stability in the region. The two sides noted that they would continue to further develop ASEAN Regional Forum (ARF) as an effective mechanism for cooperation on political and security issues in the Asia-Pacific region in the spirit of equal participation and consensus. The two sides also expressed their willingness to further strengthen consultation and coordination between the two countries in ASEM, APEC, the UN and other regional and international organisations. 10. The two sides agreed that peace, development and cooperation represented the trend of the present-day world and that equitable development of all countries was an important basis for the maintenance of world peace. Different civilisations and social systems should enjoy long-term co-existence and draw upon and benefit from each other's strong points through competition and comparison, and develop side by side while seeking common ground and shelving differences. 11. Leaders of the People's Republic of China kindly requested Prime Minister Thaksin to convey their cordial greetings and best wishes to H.M. King Bhumibol Adulyadej and H.M. Queen Sirikit, which warm sentiments were highly appreciated by the Thai side.